These systems have no ducts; therefore they avoid the energy losses that are typically associated with them. Generally duct losses account for roughly 30% of energy consumption, especially if the ducts are in an unconditioned space such as an attic. They are easier to install than other systems. Mini-splits offer more flexibility in interior design options. The indoor air handlers can be suspended from a ceiling, mounted into a drop ceiling, hung on a wall, and finally floor-standing models. The compressor is assembled outside so the units are relatively quiet. Considered “small” compared to room air conditioners, mini splits can manage to cool several areas all at the same time. Each mini-split unit has its own programmable thermostat that can cool the one room, or multiple according, to preference. The primary disadvantage of mini splits is their cost. 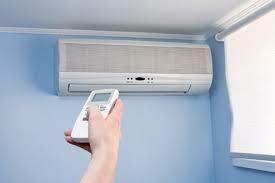 They are generally priced around traditional AC systems. Correct sizing of the system is important. Over-sized or incorrectly installed equipment often result in short-cycling; wasting energy and unable to properly control the temperature or humidity. Too large a system is also more expensive to buy and operate. It is important to have a professional install the mini-split system or the homeowner can expect a higher consumption of electricity.